What’s the record amount of time in between when a craft brewery opens and then when it needs to increase capacity to keep up with demand? Boston-area Castle Island Brewing Co. has to be close with its announcement that it will be adding three new cellar tanks from GW Kent after just seven months in operation. 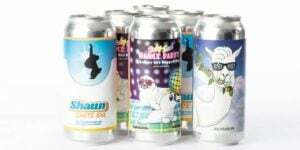 The company’s core beers, Candlepin and Keeper, have become mainstays among Greater Boston retailers and are now available in more than 650 locations. The three new tanks will raise production capacity to more than 9,000 barrels annually — a 50 percent increase. This expansion comes well in advance of what Romanow had initially planned. The company had anticipated adding more tanks before the end of the year. But with current lead times on brewing equipment eclipsing four months, the immediate need for more space pushed Romanow into ordering tanks from a new supplier that regularly stocks a small number of tanks this large. Romanow said the company’s ranks have also grown to keep up with the volume, and Castle Island now employs 16 people, a sharp increase from the four-person team they launched with in December of 2015. The new capacity will also allow the brewery to continue to develop new beers outside of the core lineup. Kicking off this effort is Juice Patrol, a new Pale Ale featuring Centennial and Cascade hops that clocks in at 7 percent alcohol by volume. This new beer follows on the heels of several other limited releases from Castle Island, including Vern — a Wheat IPA with Mosaic hops — as well as Causeway and Big Ern, a pair of double IPAs that, to this date, remain the brewery’s most highly rated and sought after beers. Castle Island released Juice Patrol at the brewery only on July 21. @jonchesto @CraftBrewingBiz @cibrewing Love those hops, Jon. @llambert_ledger @CraftBrewingBiz @cibrewing I haven’t had a Keeper yet, but the Candlepin is excellent.